Thomas Bouley describes 2012 as having a “very precocious growing season that started even earlier than 2011 did, but shortly thereafter the cool weather and rain arrived that slowed everything down. The weather was horrible during the flowering which caused a lot of shatter and shot berries. The poor flowering more than anything else was responsible for the tiny yields though there were certainly other contributing factors such as a poor bud break, hail, mildew, oidium and intense heat. In fact the virulent attack of mildew is the worst that I have ever seen though the oidium pressure wasn’t far behind. There were two hail storms, one on the 30th of June and another on the 1st of August. Then we had échaudage (sunburn) at the end of July. Thankfully the second half of August and all of September were excellent and allowed the remaining fruit to ripen properly. There was also a steady north wind that enabled the vineyards to dry out and to desiccate the damaged fruit so that it would eventually just fall off the bunches on its own. As such there was almost nothing that needed anything other than cursory sorting when we began picking on the 17th of September. In some vineyards there was almost nothing to pick and while on average we were off 60% relative to a normal crop in a few vineyards it was fully 80% or only the equivalent of 7 hl/ha! The skins were super thick and there wasn’t much juice in the berries; in fact I have never seen such a high level of solids relative to the liquids. As such I would call my vinification careful but not really soft as I wanted to be sure to extract the best that the fruit had to offer. I used less whole cluster but that doesn’t mean none as some wines had up to 80%. I like the 2012s which is at least some compensation for just how difficult a growing season it was to obtain the little fruit that we got.” This is a lovely set of wines and for value I underscore the quality of Bouley’s Hautes Côtes de Beaune as it’s terrific. As is typically the case, Bouley indicated the unbottled wines will be bottled without fining or filtration. Something has changed since I last met Thomas Bouley three years ago. What is it? The spring in his step or the firmness of his handshake? The maturity in his face? The answer does not take her eyes off me for the entire duration of my tasting on their first floor living room. The answer is fatherhood. Considering Thomas joined the club what doubtlessly feels like a very distant 4-months ago, he appears surprisingly un-fatigued given both the duties of newborn parents, on top of newborn successive tumultuous seasons for a grower whose vines lay directly in hail’s firing line. What did Thomas do when his vitis vinifera was cruelly machine-gunned with ice? “I cried,” he replied. “On the 30th of June, the hail came from the direction of La Rochepot, through Monthelie and then through the higher vineyards in Volnay such as Clos des Chene, Les Cailleret and Champans and onwards up to Pommard and Beaune. We suffered a 30-40% loss. Then there was a second hailstorm on the first of August. This caused less damage, perhaps between 5-10%. At least we could look forward to next year…then 2013 happened.” His father Jean-Marc had done 48 vintages but had never witnessed anything approaching what happened in 2012. Consequently, the average yield at this domaine is just 14.5 hectoliters per hectare. At least the damage was early in the season. The fruit that was cropped seemed healthy with thick skins. Thomas likes to keep the natural CO2 to protect the maturing wine to minimize the use of sulfur as he prefers his wines to be open and “ready for business” once they are released. 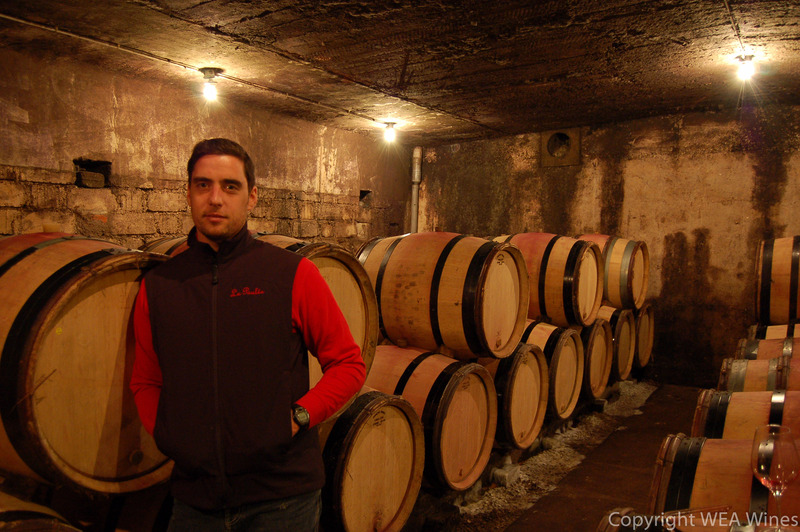 He plans to possibly extend the elevage in 2012 and keep them in wood for around two years depending on the cuvee. All the samples were taken directly from barrel the wines having not been racked. Just as I feel that Thomas has matured as a person, so I feel he is more assured about his wines that surely deserve a higher profile. Despite the disaster, he has managed to produce an impressive and to use that banal word, delicious, set of 2012s that come highly recommended. His policy of combining climats traditionally bottled separately was an astute move. in the Clos de la Cave vineyard, behind, and to the side of the domaine. Thomas is very focused on what he has to do: “I don’t hold fermentations or green harvesting, or many things like that as my primary focus. For me, my primary focus is the soil in my vineyards.” Thomas then pushed his hand into the friable soil of the Clos de la Cave and thrust a handful forward for me to inspect. “I’ll probably plough this next week” he says. The 2012 vintage, due to hail, yielded on 15 hl/ha for the domaine as a whole, but the wines are a fine testament to what remained on the vine.